The Fed Chairman then went into damage control mode, assuring investors that the central bank would “continue to implement highly accommodative monetary policy” (meaning interest rates would not change) and that tapering was contingent on conditions that look unlikely this year. The only thing now likely to be tapered in 2013 is the Fed’s growth forecast. Cochrane discusses a May 23rd Wall Street Journal article by Andy Kessler titled “The Fed Squeezes the Shadow-Banking System,” in which Kessler argued that QE3 has backfired. Rather than stimulating the economy by expanding the money supply, it has contracted the money supply by removing the collateral needed by the shadow banking system. The shadow system creates about half the credit available to the economy but remains unregulated because it does not involve traditional bank deposits. It includes hedge funds, money market funds, structured investment vehicles, investment banks, and even commercial banks, to the extent that they engage in non-deposit-based credit creation. Despite the Federal Reserve’s vast, 4½-year program of quantitative easing, the economy is still weak, with unemployment still high and labor-force participation down. And with all the money pumped into the economy, why is there no runaway inflation? . . . The way money and credit are created in the economy has changed over the past 30 years. Throw away your textbook. We start from two principles: credit creation is money creation, and short-term credit is generally extended by private agents against collateral. Money creation and collateral are thus joined at the hip, so to speak. In the traditional money creation process, collateral consists of central bank reserves; in the modern private money creation process, collateral is in the eye of the beholder. Like the reserves in conventional fractional reserve lending, collateral can be re-used (or rehypothecated) several times over. Singh gives the example of a US Treasury bond used by a hedge fund to get financing from Goldman Sachs. The same collateral is used by Goldman to pay Credit Suisse on a derivative position. Then Credit Suisse passes the US Treasury bond to a money market fund that will hold it for a short time or until maturity. Singh states that at the end of 2007, about $3.4 trillion in “primary source” collateral was turned into about $10 trillion in pledged collateral – a multiplier of about three. By comparison, the US M2 money supply (the credit-money created by banks via fractional reserve lending) was only about $7 trillion in 2007. Thus credit-creation-via-collateral-chains is a major source of credit in today’s financial system. The shadow banking system is controversial. It funds derivatives and other speculative ventures that may harm the real, producing economy or put it at greater risk. But the shadow system is also a source of credit for many businesses that would otherwise be priced out of the credit market, and for such things as credit cards that we have come to rely on. And whether we approve of the shadow system or not, depriving it of collateral could create mayhem in the markets. According to the Treasury Borrowing Advisory Committee of the Securities and Financial Markets Association, the shadow system could be short as much as $11.2 trillion in collateral under stressed market conditions. That means that if every collateral claimant tried to grab its collateral in a Lehman-like run, the whole fragile Ponzi scheme could collapse. That alone is reason for the Fed to prevent “taper tantrums” and keep the market pacified. But the Fed is under pressure from the Swiss-based Bank for International Settlements, which has been admonishing central banks to back off from their asset-buying ventures. Six years have passed since the eruption of the global financial crisis, yet robust, self-sustaining, well balanced growth still eludes the global economy. . . .
Central banks cannot do more without compounding the risks they have already created. . . . [They must] encourage needed adjustments rather than retard them with near-zero interest rates and purchases of ever-larger quantities of government securities. . . .
Delivering further extraordinary monetary stimulus is becoming increasingly perilous, as the balance between its benefits and costs is shifting. Monetary stimulus alone cannot provide the answer because the roots of the problem are not monetary. Hence, central banks must manage a return to their stabilization role, allowing others to do the hard but essential work of adjustment. So concludes the BIS, but the failure may not be in the theory but the execution of QE. Businesses still need demand before they can hire, which means they need customers with money to spend. 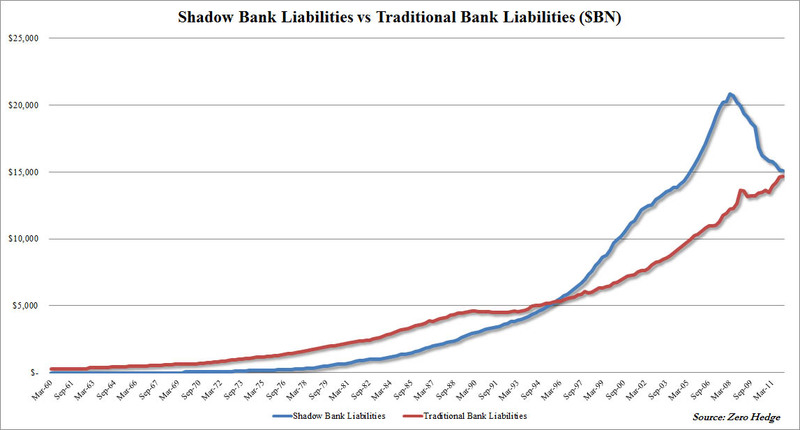 QE has not gotten new money into the real economy but has trapped it on bank balance sheets. A true Bernanke-style helicopter drop, raining money down on the people, has not yet been tried. The Fed could avoid collateral damage to the shadow banking system without curtailing its quantitative easing program by taking the novel approach of directing its QE fire hose into the real market. One possibility would be to buy up $1 trillion in student debt and refinance it at 0.75%, the interest rate the Fed gives to banks. A proposal along those lines is Elizabeth Warren’s student loan bill, which has received a groundswell of support including from many colleges and universities. Another alternative might be to make loans to state and local governments at 0.75%, something that might have prevented the recent bankruptcy of Detroit, once the nation’s fourth-largest city. Yet another alternative might be to pour QE money into an infrastructure bank that funds New Deal-style rebuilding. The Federal Reserve Act might have to be modified, but what Congress has wrought it can change. The possibilities are limited only by the imaginations and courage of our congressional representatives.